AhPek’s Laughing Buddha brings money luck! 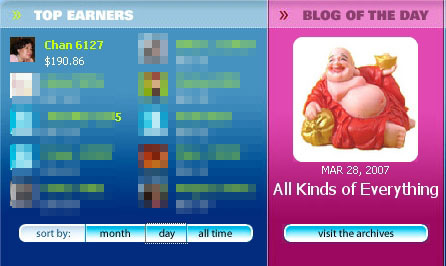 On 28th/29th March, 2007, AhPek‘s Fixit Blog was made Blog of the Day on PayPerPost. I just lurve the chubby laughing buddha icon he use. Laughing Buddha is a favourite statue that most Chinese (of non-Christians faith) place in their home for money luck. It is not worship but place as a symbol of happiness and joy. So, can I say the cute icon of AhPek has bring money luck to me? I made USD190.86 or approximately RM650 PER NIGHT. You can see the screenshot of me in the highest day earner – Chan 6127. Heh, this is not my highest record so far. I had done over USD230 once. Of course, I don’t do such stunts every night, only when I have the competitive streak to grab all I can when I am high on caffeine. Blame this on the kopi-kau from Old Town Kopitiam which I drank at 9pm. The above was the post that is now sort of ‘old’ because my site was down. i hope you get some good linky loves! You can blog about this tag in one of your sites which fits best! hai…. i wait wait for so many months oni my blog appear, buthen the whole blog went down, so nobody can see. AhPek – Tell me about it! LOL. I see $$$$ flies away. But never mind, u have so many blogs, sure got chance again. Osman – Oops, done that before.